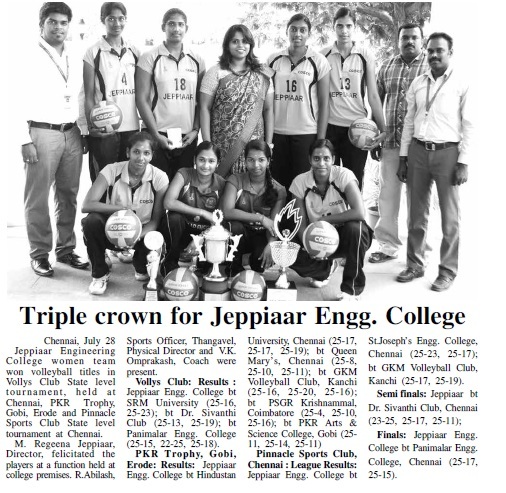 Jeppiaar Engineering College has facilities for Indoor games like table-tennis, carrom and chess.It also provides facilities for outdoor games like basket ball, volley ball, football, cricket, throw ball and kabadi with separate court for each.Indoor Stadium facilities for both boys and girls hostels. 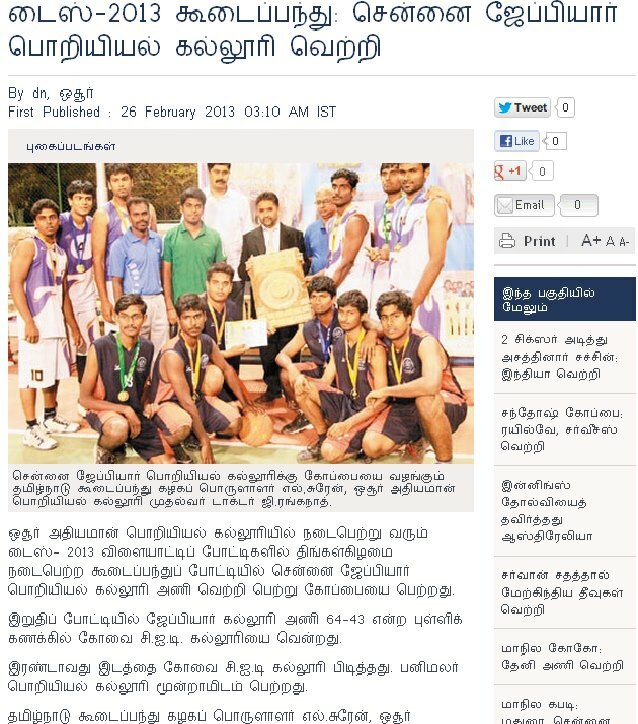 Anna University Champions for past 3 years. 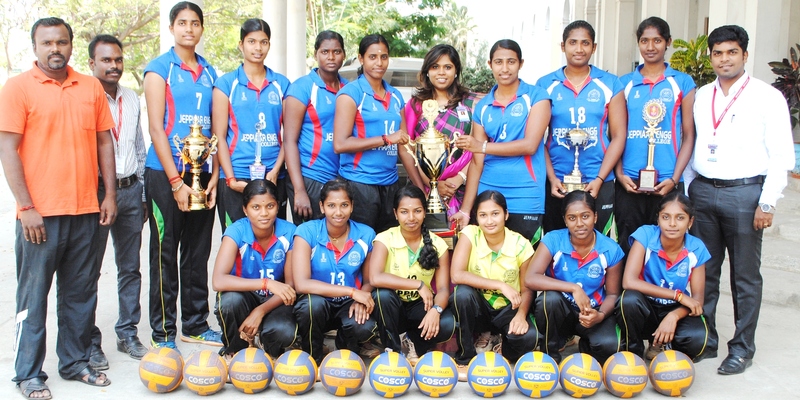 Anna University’s Zonal Trophy Winners for Four Consecutive Years. 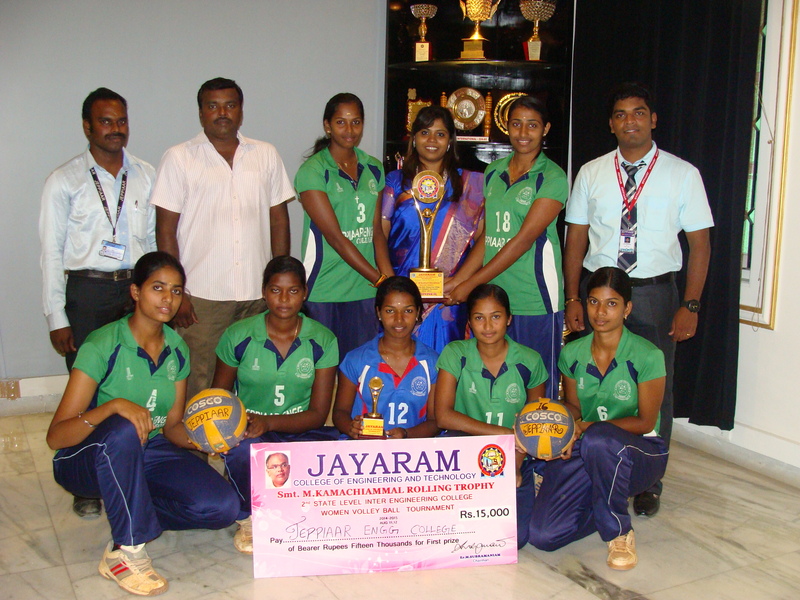 SRM Founder’s Trophy & Reliance Foundation Cup, Chennai Champion. 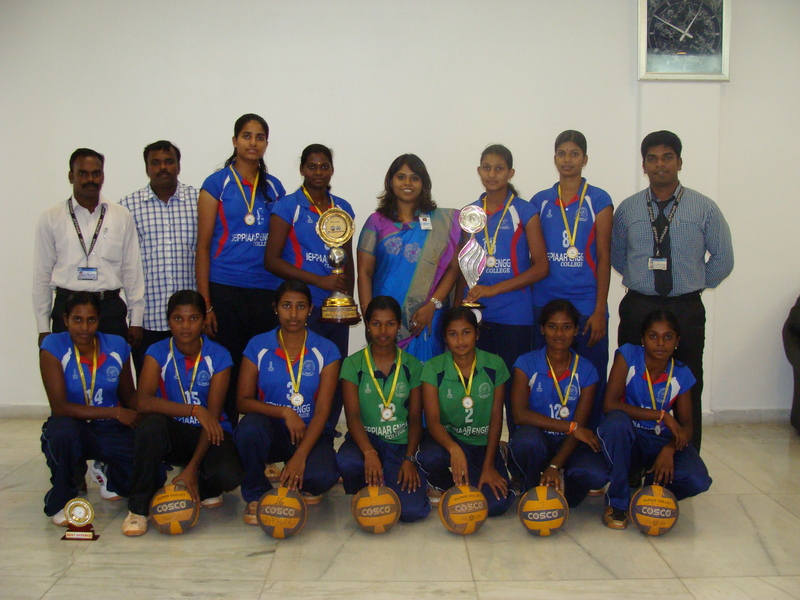 Played in Reliance Foundation National Finals, Mumbai. 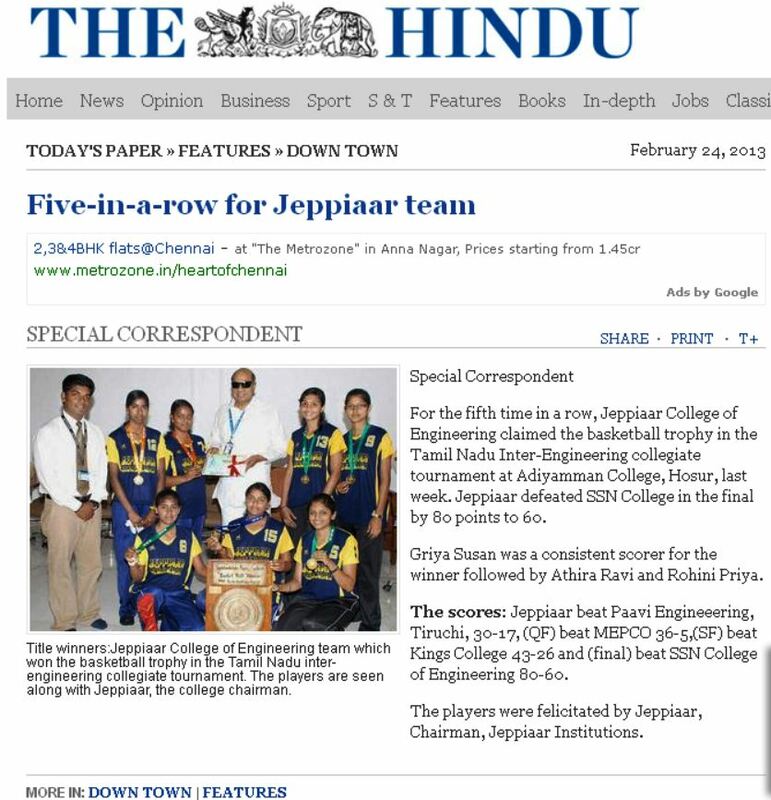 Tied-Up with Leading Football Academies & Clubs in Spain. 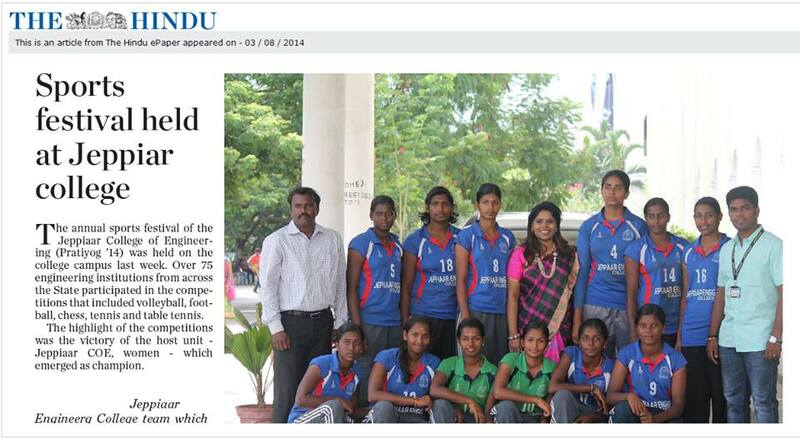 Our own Football Plus Professional Soccer Academy is currently playing under-13 & 15 AIFF – I League. 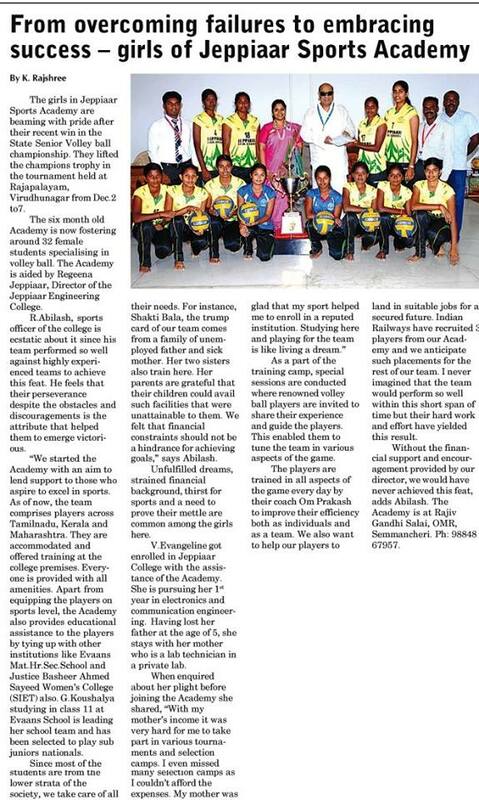 Football Plus Professional Soccer Academy listed as one of the top 10 academies in India. 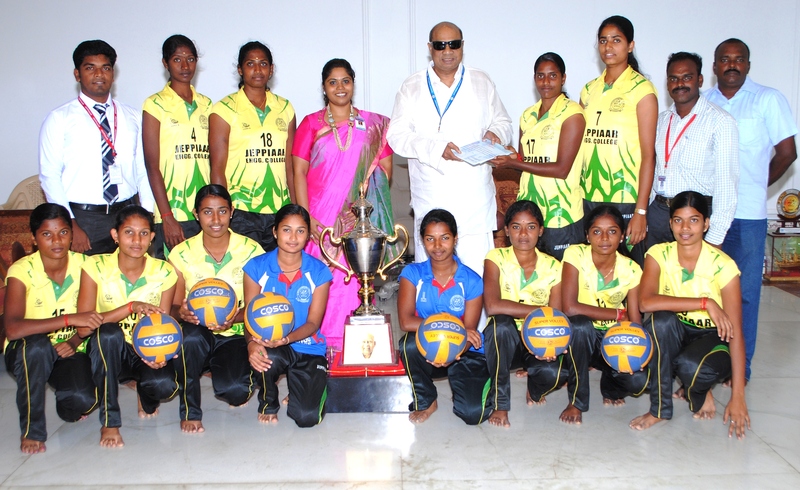 Tamilnadu Senior Team & Anna University Team consists of our players playing for them. 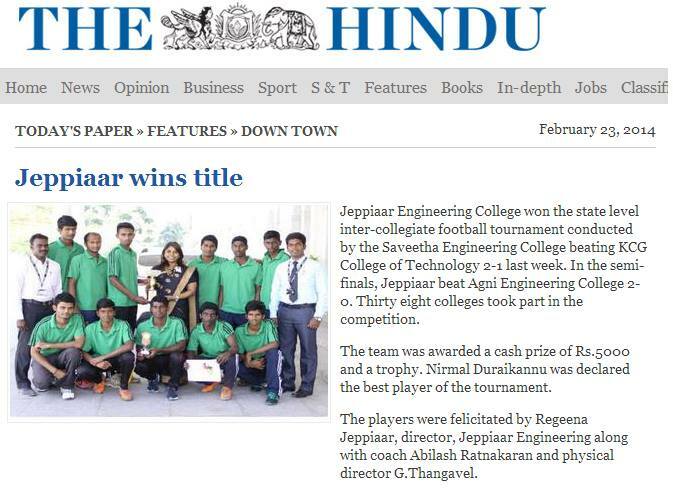 Jeppiaar engineering college won the football 5’s title in SRM “MILAN 2015”-National level sports and cultural festival Which was held from January 29 – February 1 2015 at SRM UNIVERSITY campus. 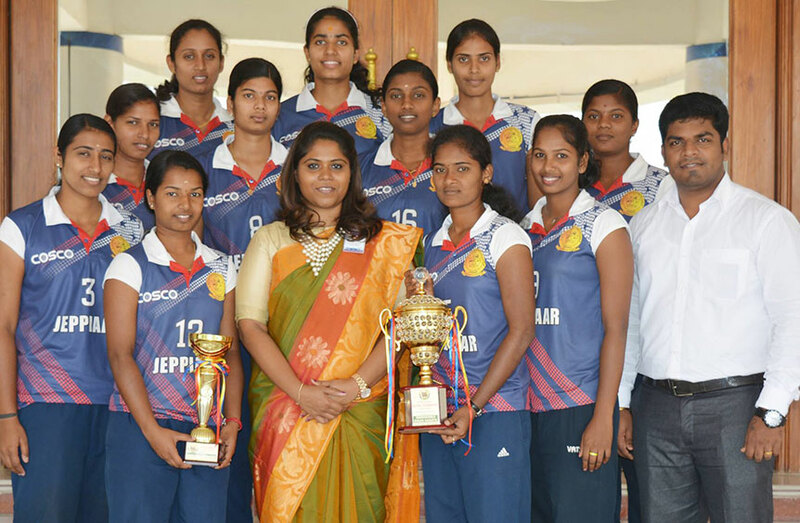 “Jeppiaar engineering college” women volleyball team emerged as winners in the senior state championship which was held at rajapalayam from dec2-7. 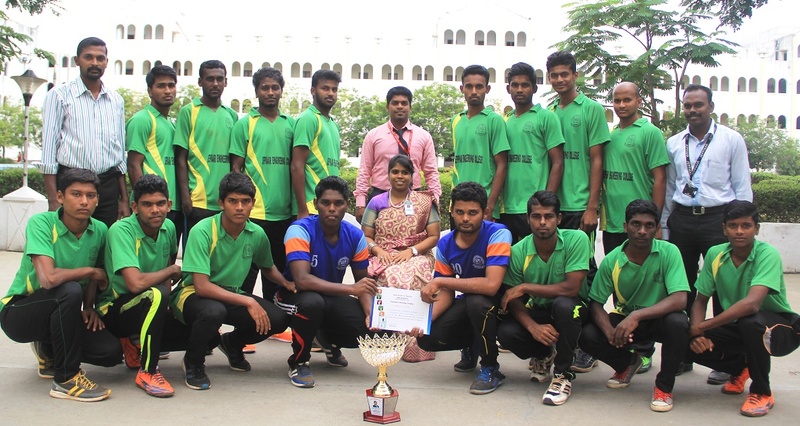 Mr.Sreenivas iiyr ECE department has won the anna university boxing championship.He will be representing anna university for the all india championship which is going to be held at Delhi in the month of feburary. 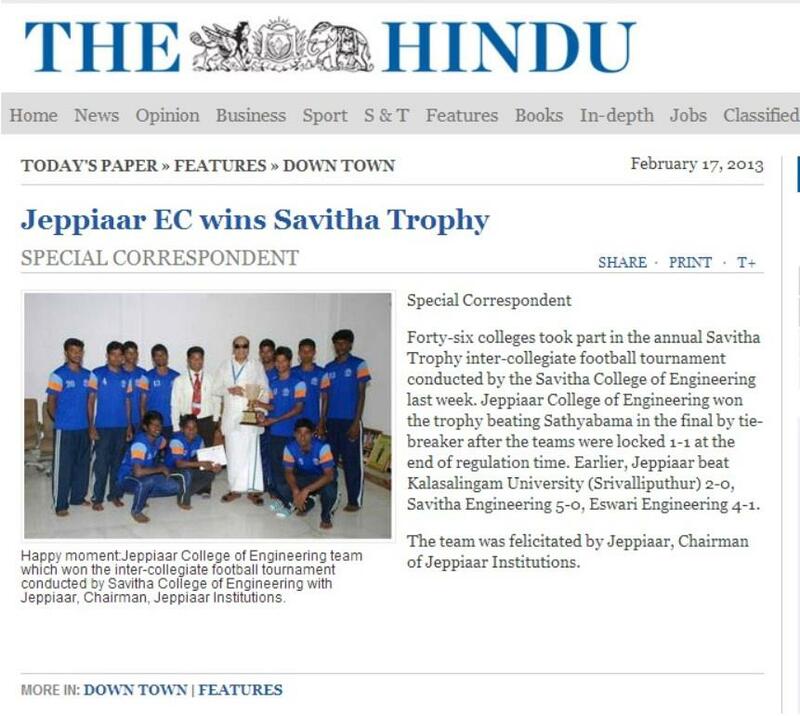 Jeppiaar engineering college won “SPORTIVA’14” a state level football tournament conducted by parisutham institute of technology(PITS), Thanjavur. 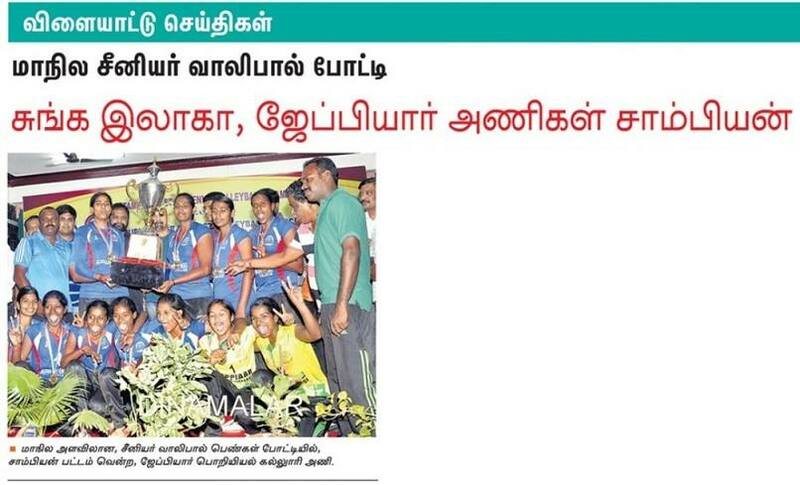 our team was awarded with a cash award of Rs.10000/- along with a trophy,medals and certificates. 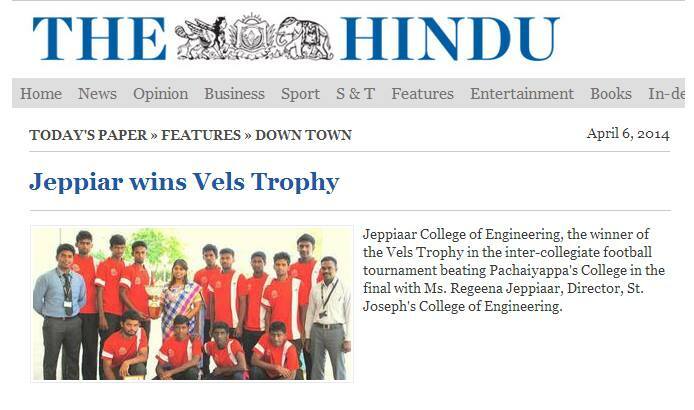 JEPPIAAR ENGINEERING COLLEGE FOOTBALL TEAM WINNERS OF SRM UNIVERSITY State level TOURNAMENT held at SRM University,Kattankulathur. 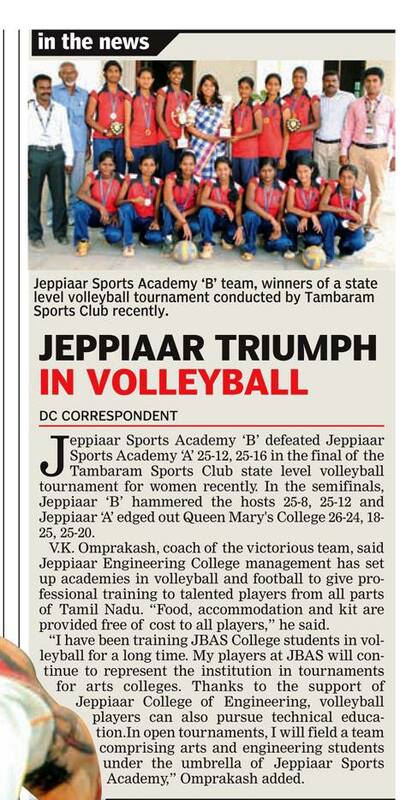 Jeppiaar Engineering College won Title in the Inter Collegiate Volleyball TOURNAMENT at Jayaram College of Engg. 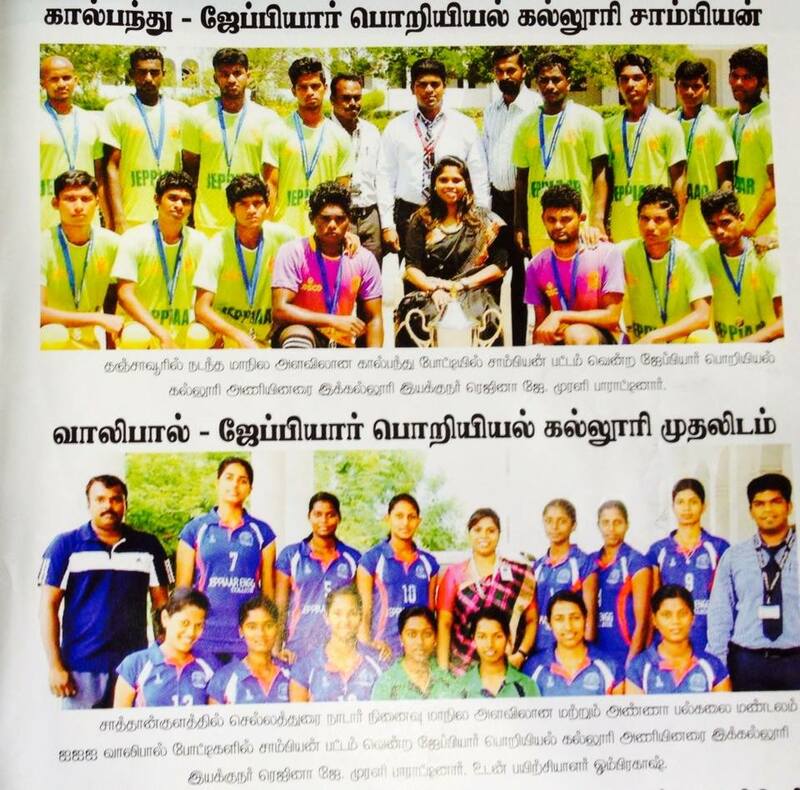 & Technology, Thuraiyur (TK), Trichy (Dt.) 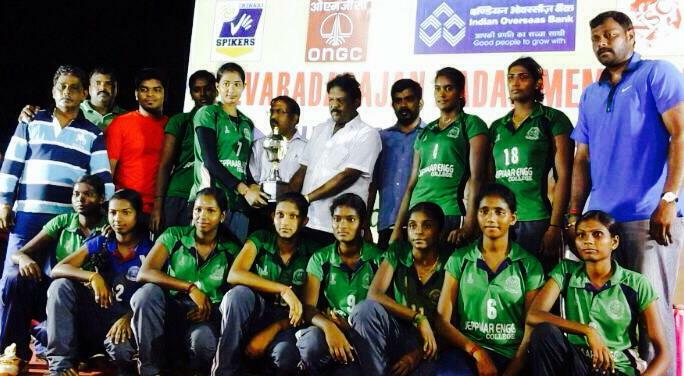 on 11th and 12th August,2014. 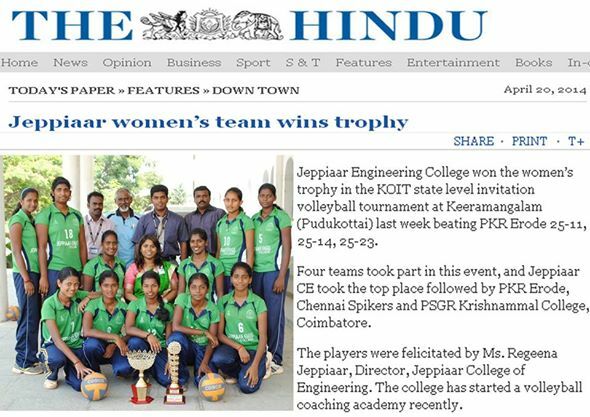 Jeppiaar Engg. 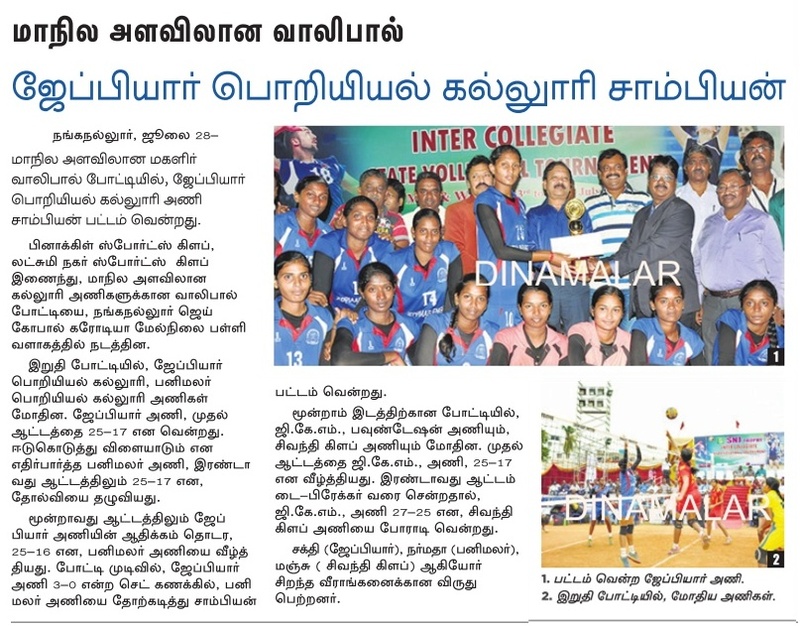 College won the All India Volleyball tournament at Nedungadu, Karaikal organized by Nedungadu sports club and Chennani Spikers volleyball club organised an All India Volleyball Tournament from 09/05/2014 to 11/05/2014. 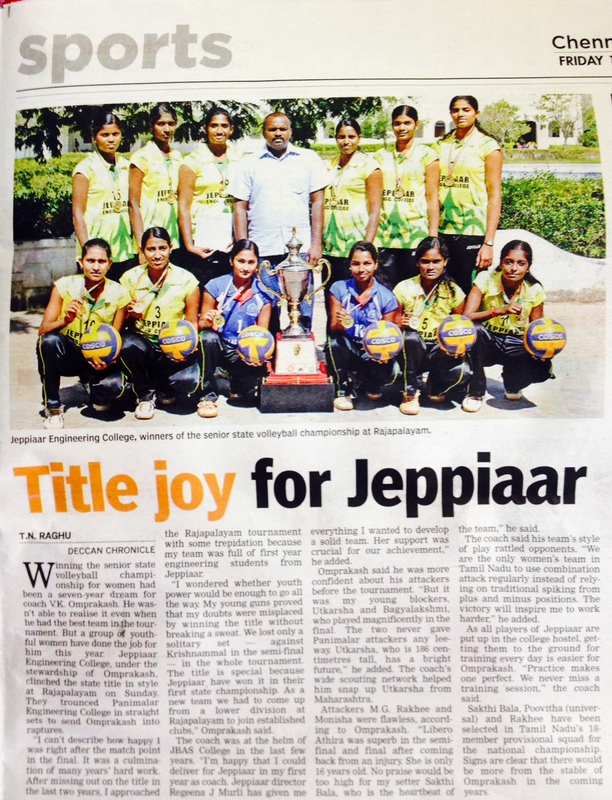 Jeppiaar Engg. 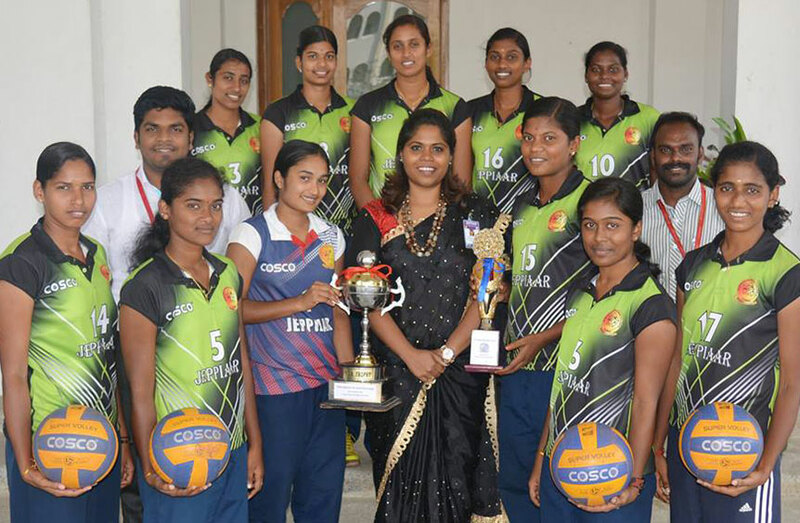 College won the State Level VOLLEYBALL TOURNAMENT at Tiruchengode, Namakkal (Dt) from 20th to 22nd August 2014.